Worth Noting: Another 50+ miles of the GMRT lie outside Montgomery County. When nearby trails were built and the Great Miami River Trail expansion became reality, opportunities to travel by trail multiplied dramatically. Today, the extensive expansion of the Great Miami Trail has set the tone for trail development in the area. 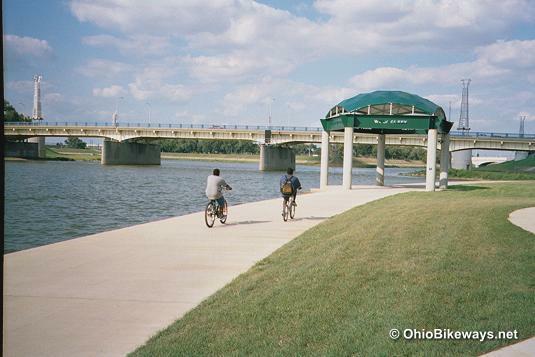 Recent years have seen the expansion of the Mad River Trail, along with its connection with the Wright Bros/Huffman Prairie Trail, the creation of the Dayton-Kettering Connector, and the beginnings of another connector with the Little Miami Trail, the Great Little Trail route. The number of communities linked by trail continues to grow in this area as two remaining gaps in the Great Miami River Trail have yet to be closed. While the Dayton-area bikeway network would be sufficient for most trail travelers, there's more to the bigger picture here. The close proximity of the Xenia Trail Network, a mere 18 miles to the east, means that two extensive networks lay literally side-by-side. And of course, the Creekside Trail serves as the bridge that connects the two. For enthusiasts, that's about as close as you can get to trail nirvana. When all the connections are completed, it'll be closer yet! On the banks of the Great Miami River, RiverScape Metropark can be both a destination and a launching point. Bike rentals are available here, right alongside the Great Miami River Trail! The Miami Valley Regional Planning Commission (MVRPC) played an active role in bike advocacy long before other Ohio planning commissions regarded bikes as a serious form of transport. That likely played an important role in SW Ohio trail development, allowing it to lead the state in that regard. Link Dayton, the area bike share, was launched on May 5, 2015.